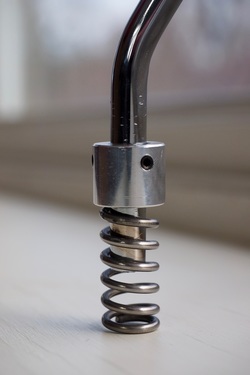 Flex Tips™ Floor Tom Leg Isolators - Pack of 3 - Standard Diameter 3/8" to 7/16"
Flex Tips™ maximize floor tom resonance using a low harmonic frequency spring to stop the drum's vibrations from traveling through the legs and into the floor. ​Flex Tips™ are currently available for standard diameter legs size 3/8" to 7/16" only. Most manufacturers of drums suffer from floor tom leg design and the drums don't sustain. I'm currently out Tech-ing for Josh Baker and both of us can't believe how much the Flex-Tips improved the sound." While our Dynamount™ Floor Tom System is ideal for drums with un-drilled shells and does away with shell mounting, Flex Tips™ offer an effective resonance solution for floor toms with legs already mounted to the shell. They are sold in one size for Standard floor tom leg diameters 3/8" (9.52mm) to 7/16" (11.10mm). Simply remove the rubber ends currently on your floor tom legs and secure FlexTips with the provided allen wrench, making sure the leg is centered in the Flex Tip™ collar. Before purchasing, you can test your floor tom to see what kind of resonance loss is occurring within your drum. Simply have someone pick the drum up off the floor and play it while it is being held. Then set it back down, and listen for the difference. Try placing the drum on different surfaces (carpet vs. concrete, etc) to see how this changes the resonance.